The project was funded by the National Science Centre (Poland) based on the decision number DEC-2013/09/B/NZ9/01829. The aim of the project is to asses importance of laccase in Cerrena unicolor adaptation to degradation of several wood kinds and various environmental factors (nutritional, temperature, pollutants). Cerrena unicolor belongs to the group of white-rot fungi and is growing mainly on live or dead logs of many hardwood trees: Fraxinus excelsior, Betula sp., Salix sp., Acer sp., Malus sylvestris, Sorbus sp., Aesculus hippocastanum. 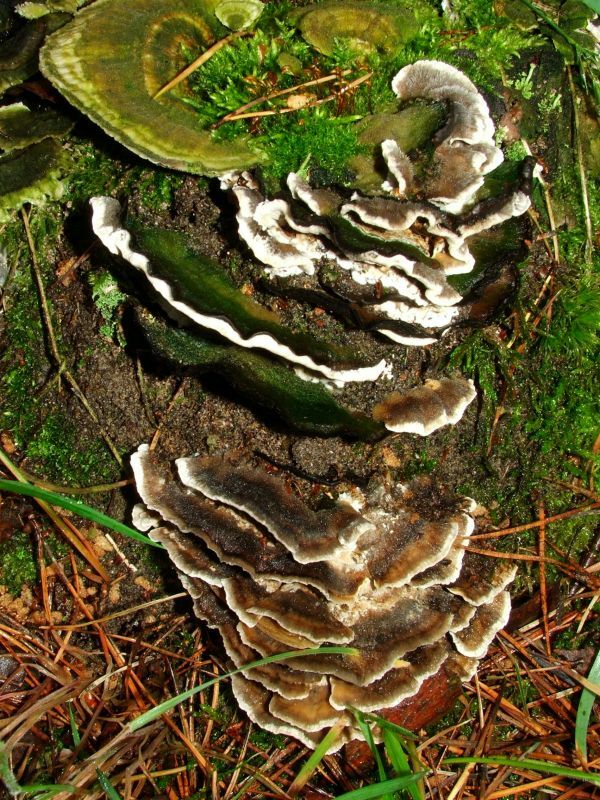 C. unicolor has been identified as a source of laccase, which is produced in its culture in higher yield than in other wood rotting fungi, which may be a natural evolutionary advantage. In nature laccase is engaged in lignin degradation, which polymer is the main barrier in efficient wood degradation. There is a lack of data describing other ligninolytic enzymes in the genus Cerrena produced in amount comparable to laccase. This may support the thesis that this enzyme is mainly engaged in lignin decomposition realized by this fungus in consequence leading to natural detoxification of environment. The basis of the planned research is the hypothesis that Cerrena unicolor adaptation to efficient decomposition of various wood kinds is mainly due to the ability to produce high amounts of several laccase isoforms with different characteristics. Moreover a diverse C. unicolor laccase profile and its high activities are supposed to be responsible for its adaptation to environmental changes (nutritional, weather conditions, pollutants). Since the laccase production is influenced by a number of factors the main research objective of the project will be Cerrena unicolor laccase profiling in regard to changing nutritional and environmental conditions. It is planned to analyze laccase production in four variants of culture medium and under influence of seven different inducers. Analysis of proteases production in relation to laccase synthesis will result in conclusion how laccase maturing is dependent on protease activity. The expected results will allow to asses physiological functions of each laccase isoforms during Cerrena unicolor adaptation to environmental and nutritional changes. After performing all above analysis it will be known whether all Cerrena unicolor laccases isoforms are equally synthesized with regard to environmental conditions. It should be possible to assign each isoform functions such as lignin degradation, response to temperature or free radicals shock. Moreover, interactions between parasite and host organism will be addressed. The expected results of the proposed project will allow to determine Cerrena unicolor ability to decompose different wood kind and its influence on carbon cycle in forest habitats. Bearing in mind that this fungus is hardwood infectant the conducted analysis will be important considering the influence on forest industry. The obtained results will enrich knowledge about biotechnologically important fungal laccase regulation in respect to environmental factors. Moreover influence of this factors on laccase production will be important to assess the effect of environmental pollution on fungal wood decomposition. The research results obtained in the course of the project will be prepared for publication in foreign press, that is in Polish and international science journals and magazines. These results will also be disseminated in the form of reports, papers and posters during science conferences, symposiums and meetings in Poland and abroad. All these results will be available on Department of Biochemistry MCSU website, in the shape of original written works, elaborated and published as well as in the shape of conference news bulletins. Such presentation and publicity methods will increase the results’ accessibility and dissemination and will also increase the possibility of their practical use, both in economy sector and in science field.